1) The tournament becomes a part of the prestigious international system of the ACP Tour. 2) For members of the ACP, tournament inclusion in the ACP Tour becomes one of the key factors for deciding about participation. 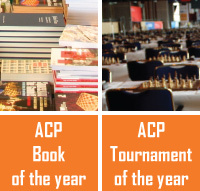 3) The ACP provides additional opportunities to spread information about the tournament and its results. 1) Chess player gets the results of an objective system, which allows the calculation of performance in the tournaments of various formats throughout the season. 2) A member of the ACP does not depend on fluctuations of Elo-rating of FIDE, because the results of only one season are taken into account, and there is no annual savings. 3) Any member of the ACP has a chance to earn the right to take part in the ACP Cup. 4) As a result of the recent agreement with FIDE, the winners of the ACP Tour will get a place in the World Cup and the Candidates tournament.